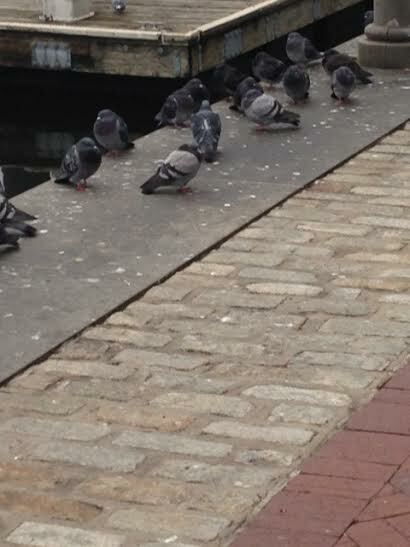 During my recent trip to Baltimore, I walked by a woman throwing pieces of bread to the pigeons near the docks. It was obvious from the amount of bird poop that this was a regular occurrence. The next day as I walked by that spot at the same time, the woman was not there but the birds were there in force. They had a learned to at least partially depend on the “bird lady” for food. The pigeons had mildly abandoned their heritage as scavengers and become slightly domesticated. I don’t know that these birds were completely reliant upon the bird lady but they were definitely foregoing the hunt for the comfort of waiting for the “sure thing”. These birds represent many of us that are caught up in the paradigm of modern civilization. Humans were at one point hunters and gatherers. As we developed means of food production, individuals could sustain themselves and others with their crops and domesticated animals for slaughter. Eventually fewer people were producing food and the majority of us became consumers that relied on their work. In many ways this is an unnatural state for man to be disconnected from his hunting instinct. We have built systems of competition in business and sport that mimic the hunting instinct. However in recent years it seems that people are being trained to accept only what is handed to them. For the moment the “bird lady” is showing up regularly and handing out the bread. What happens when the bird lady doesn’t come back? The birds will most likely find a new place scavenge while the more “evolved” creatures will blame and complain about their circumstances. People who have had everything handed to them fight to maintain that situation rather than adapt. So even though a proactive approach would lead to more self determination, people abdicate the power for comfort. Those in power will never beg you to take the initiative remove their control on your situation. They will try to perpetuate the status quo because it only costs them scraps in exchange for keeping you under their thumb. So look at the life that you’re leading. Are you dependent on the bird lady for your survival? What would you do if she disappeared? Begin to take your independence back. Perhaps she’s got you financially, emotionally or physically. Regardless of the hold, you owe it to yourself to break free.